The Begole Archaeology Research Center (BARC) is an important archaeology laboratory and storage facility located near the Park Visitor Center in Borrego Springs. The BARC facility houses artifacts gathered from numerous prehistoric and historic sites within Anza-Borrego Desert, Cuyamaca, and Palomar Mountain State Parks. These artifacts are protected with curation quality materials and shelving and stored in a climate-controlled environment. Distinguished scholars come the Begole Archaeology Center to study these artifacts and add to the archaeology knowledge base about the indigenous people who lived in the Colorado Desert for thousands of years. In 2018 several notable scientists came to the BARC lab to see the collections and do research. Steve and Kathleen Holen of the Center for American Paleolithic Research, and Curtis Runnels, a Paleolithic tool specialist and Archaeology Chair at Boston University, and Pricilla Murray, a lithic specialist, all visited. While in Borrego Springs Steve Holen and Chris Runnels presented talks for the public about their specialties. Recently some very old tool specimens were sent to Dr. Tanzhou Liu in New York for testing. Dr. Liu can analyze and date the layers of desert varnish that have built up over many years through a process called Varnish Microlamination (VMI). VMI testsspecific concentrations of elements such as boron and magnesium comparing them with other known dates. These date correlations can help determine the age of the tools. 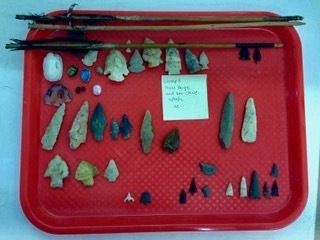 Archaeologist and CDAS volunteer catalog artifacts. 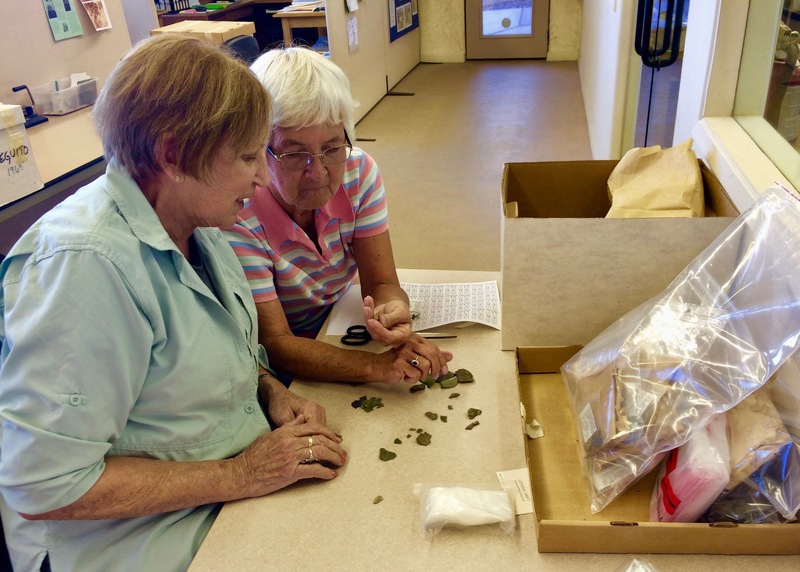 Trained archaeology volunteers work in the BARC lab every week on a variety of projects. Labs Days are regularly held on Tuesdays, 9:00 am – 4:00 pm during the October 1 – May 1 season. Many jobs are available to qualified volunteers. These include weighing, measuring and cataloging non-accessioned artifacts, digitizing site records, using the new The Museum System to record artifacts consistent with California State requirements, and assisting to complete a full inventory of all artifacts in the BARC. If you have been through or are completing your Archaeology Training with the District Archaeologist, and would like to volunteer, there are lots of helpful things you can do. If you are qualified and interested please contact Julie Nyssen at janyssen@gmail.comfor more information.